Bring soft, reassuring illumination to your little one's room with this small Birdhouse Night Light from My Baby Sam. 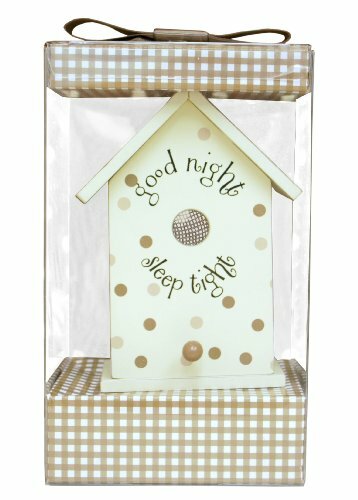 The Small Birdhouse Night Light in Brown - 'Good Night Sleep Tight' features: Adorable birdhouse shape is decorated with blue dots and "good night sleep tight". Housing keeps the bulb away from little hands. Dimensions: 7"L x 4"W. Comes with a 4-watt bulb, Max 7 watts bulb. UL listed, Turns on and off via switch.